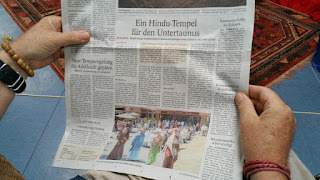 This week a nice article appeared in the leading regional newspaper, the "Wiesbadener Tagblatt", about the 10 year anniversary of Bhakti Marga. It was positioned on the front page of the regional section. We would like to share a translation of its contents with you. The link to the online edition of the article in German can be found here. 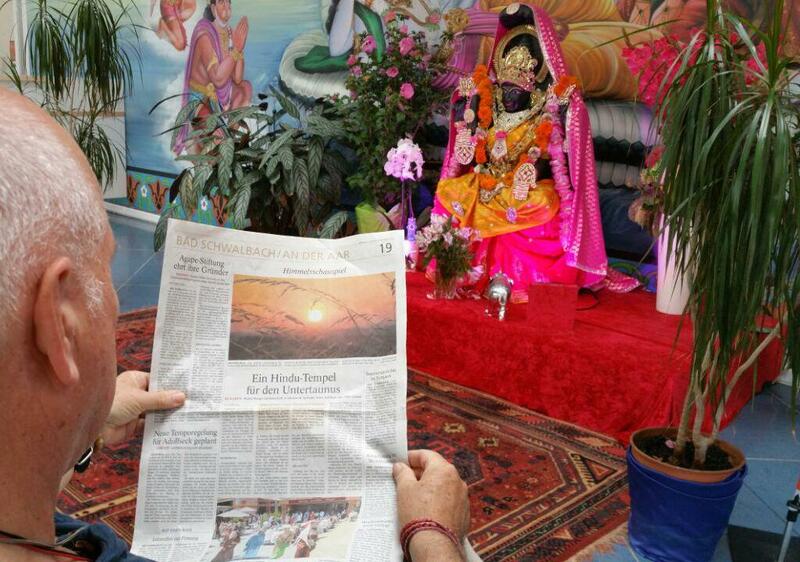 SPRINGEN - Around 2,000 people came for the ten year anniversary of the spiritual community Bhakti Marga (path of devotion) to their centre in Heidenrod-Springen. License plates ranging from Kiel to Konstanz, from Russia via the Netherlands to Portugal could be spotted across the parking lot. But also guests from Japan, Brazil or Morocco came for celebrating the anniversary with their spiritual master Sri Swami Vishwananda. The festival atmosphere in the extensive premises is accordingly lively and colorful. Children are playing football in the garden, or trying out archery. At small stands vegetarian dishes from India are offered, grilled or out of the pizza ovens. Off the big stage, a singing and dancing crowd has gathered around a musician of the 'Bhakti Sounds' kirtan band who combines the Van Halen classic 'Jump' with mantras. "Music is an important part of Bhakti Marga, because it goes straight to the heart and is an expression of the soul," explains Stephan Meyer. The 48-year-old is a man of the first hour of the spiritual community. "I met Swami in Switzerland in 1998. In the early years we were friends and then it evolved into a teacher-disciple relationship", he recalls. Eventually in 2003 the founder of the community, who is a native of the island of Mauritius, and half a dozen men and women first gathered in Idstein/Germany. From there they went on a search of a place where they could live together. "At first it was like a commune. We would sit in the kitchen together to cook and chat," says Stephan Meyer. The first Ashram was set up by the Community end of 2004 in Steffenshof in the Hunsrück region, shortly after which Bhakti Marga was officially launched. Then in 2007 the community discovered the former trade union centre in Springen and began with its renovation the following year. In 2013 the centre could be officially opened. Now the next step is about to be undertaken in which one of the buildings is to be converted into a large Hindu temple. 2.5 million euros are needed for this endeavour. A sum which can't be generated out of the running operations. Thus not only the concept of the temple was introduced as part of the anniversary celebrations, but also the fundraising was started. Furthermore the plan is to launch a Bhakti Marga academy to disseminate the teachings and contents of the spiritual community. The reason simply being, that after ten years, in which already 23 temples and centers have been established around the world, one now wants to go more to the outside. The World Peace Prayer Society launched the Peace Pole Project already back in 1976. All over the world the poles proclaim the following message (usually in several languages): "May Peace Prevail on Earth." To mark the tenth anniversary of the spiritual community in Heidenrod-Springen, its founder Sri Swami Vishwananda was now presented with such a peace pole which can be found at the entrance section of the ashram.